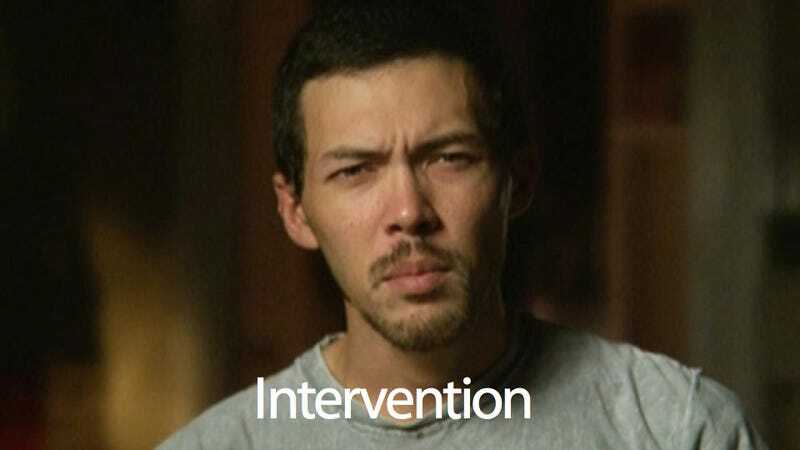 In keeping with our ongoing coverage of #bathsaltsummer, today's movie night is actually a single episode of the A&E documentary television series Intervention. We know this isn't a movie, but we hope you'll let it slide. Season 11, Episode 8 of Intervention brings us Jessa and Skyler. Jessa is an alcoholic and meth addict recently discharged from the navy. Skyler (24), a one-time Discovery Kids kid reality-show contestant, is addicted to bath salts—he's the one to pay attention to. From a young age, Skyler was pushed into all sorts of activities and extracurricular by his mother, who through her son was trying to live out her own fantasy life. Skyler did all manner of sports and even secured a role on the Survivor-inspired Discovery Kids reality competition show Endurance—on which he was promptly labeled the "Asian nerd." Sad. Skyler's father—an exotic dancer who split when Skyler was just a baby—has recently reentered his son's life; his mother is at her wit's end. Skyler snorts up to 10 lines of bath salts, a synthetic stimulant containing the amphetamine mephedrone, every day. At the time of this episode's filming, Skyler has been addicted to bath salts for seven months. On bath salts, Skyler hallucinates, experiences psychosis and paranoia. He hears voices and sees shadow monsters, against which he cobbles together homemade weapons of defense—poles and bulbs and tape and batteries, mainly. "This can kill 'em, if I put it through their heart or their brain," he says, of one such contraption. In one six-month period, Skyler was admitted to the emergency room four times for bath salts-related psychosis. Four a 24-year-old, he's rather far gone. Incredibly, Skyler's interventionist Jeff VanVonderon—who typically, like the rest of the interventionists on the show, is the picture of preparedness and power—must call in a bath salts specialist, because the drug is just so new and not yet widely understood.